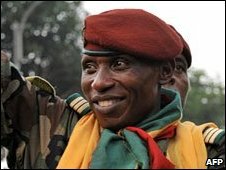 Guinea's military leader has banned all "subversive" gatherings days after soldiers opened fire at a mass rally, killing a large number of people. 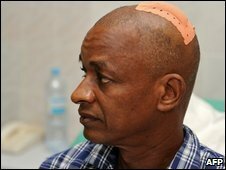 In a televised address, Captain Moussa Dadis Camara said troublemakers would be "severely punished". He also announced two days of national mourning and pledged to investigate the violence some of which he blamed on "uncontrollable" elements in the army. 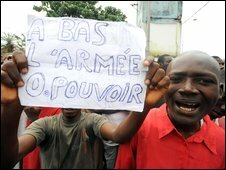 Rumours that Capt Camara intends to run for president sparked Monday's protest. He took power in a bloodless coup late last year and promised to step down after overseeing a transition back to civilian rule. But recently he has refused to rule out his candidacy in an election he has scheduled for January next year. The BBC's Alhassan Sillah in the capital, Conakry, says Capt Camara now appears to be handing out the stick and the carrot at the same time. He is promising to support those who were injured in the violence, while at the same time accusing opposition politicians of fomenting trouble. Capt Camara said the nation would be in mourning on Thursday and Friday, when flags would be flown at half mast and solemn music played on national radio stations. But he warned: "Any gathering from whatever side and nature and with subversive character is banned until further notice. "I am calling on all the religious authorities, opinion leaders, political party leaders, organisations of the civil society, and the media to refrain from statements and activities that are capable of disturbing public order. "Troublemakers and their sponsors will be severely punished." Local activists say at least 157 people were killed when soldiers fired directly at protesters, though government officials put the death toll at 57. Eyewitnesses told rights groups that soldiers raped women in the streets and ran protesters through with bayonets. One Conakry resident told the BBC's Network Africa programme that gunshots could still be heard overnight on Tuesday. And rights groups told the AFP news agency that soldiers were continuing to abuse civilians throughout Tuesday. There has been worldwide condemnation of the violence, with the UN urging the authorities to show restraint, and regional economic bloc Ecowas reportedly threatening sanctions. France says it will suspend military co-operation with its former colony. But analysts say international bodies have little leverage as Guinea is a resource-rich, wealthy nation enjoying heavy investment from foreign mining firms. Africa analyst Paul Melly told the BBC that Guinea's former ruler, Lansana Conte, survived years of aid suspension from the EU without caving in to demands for political reform.